and, since 1991, known as Vynohradiv in the Vynohradivskyi rayon (district) and the Zakarpats'ka oblast (county) of Ukraine. 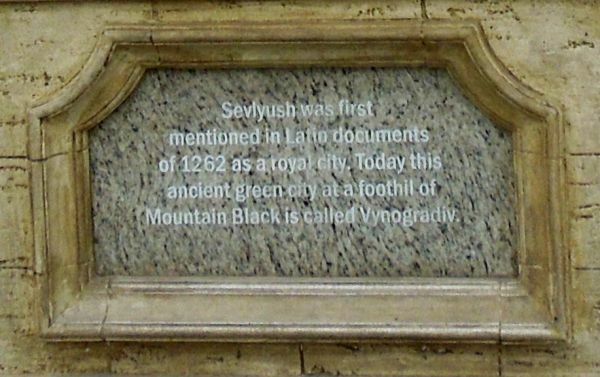 Other spellings/names for Vynohradiv are Szöllös, Seylesh, Selish, Szevlyus, Szhelish, Seleusu Mare, Velký Sevluš, Wynohradiw, Beregszollos, Sasvar, Sevliush, Sevlyush, Sevljus, Sewlusz, Sollos, Winogradow and Horvinogradovo. Vynohradiv is located 12 miles W of Khust (Huszt), 18 miles E of Berehove (Beregszász), nearby the borders of Hungary and Romania and is located nearby the Tisza river which flows down from the Carpathian Mountains. The town was first mentioned in 1262 by the name Zceuleus. Its Hungarian name, Nagyszőllős, is derived from szőllő meaning "grape," since the area is an important wine district. The town was one of the oldest in Ugocsa comitatus and was inhabited by winemakers of the royal court of that time who helped make the town and the rest of the province the wine district it is today. In 1329, King Charles Robert granted privileges to the town, which became the seat of the comitatus, a rank held until the Treaty of Trianon was signed in 1920. On 23 January 1662, during the Battle of Nagyszőllős, Prince János KEMÉNY, who was ruling Transylvania at that point, was defeated and killed by the Ottoman army allied with Prince Apafi. Later, in 1717, most of the citizens of the town were all killed by a group of invading Tartar horde invading the area. The first Jews probably settled in Nagy-Szöllös in the first half of the 18th century. In 1768, two Jewish families were living there. 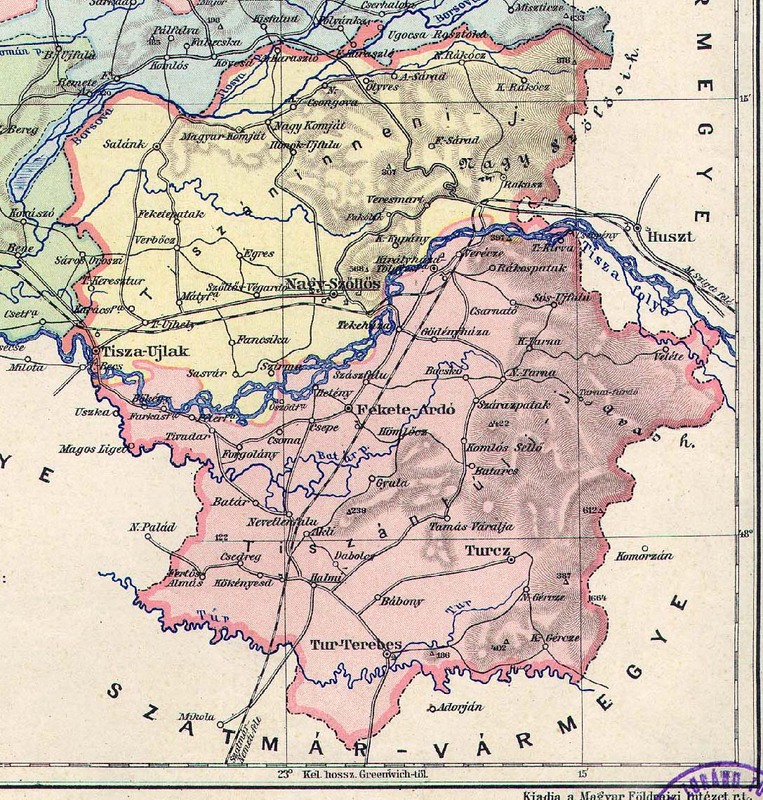 In 1880, the population of Vynohradiv amounted to 4,400, of which five hundred of the residents were native Romanians. 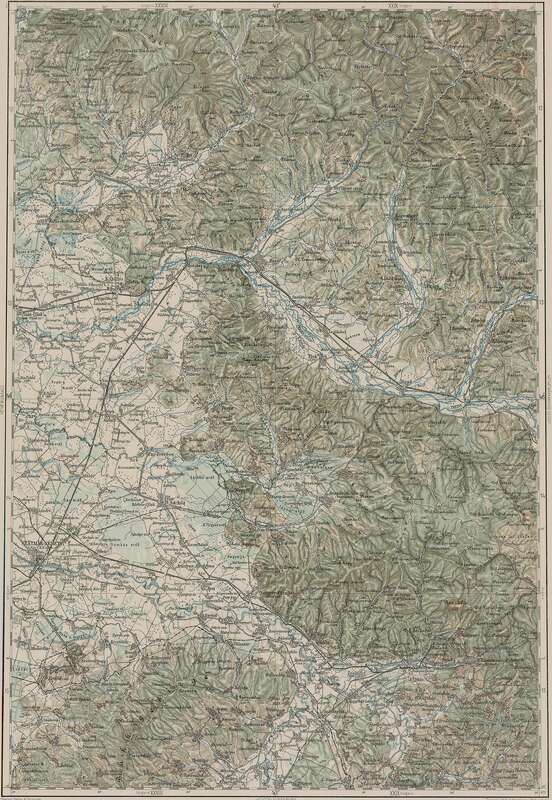 By 1877, the population of Nagy-Szöllös was 1,191 made up of Hungarians, Rusyns and Jews and comprised the following religions: Roman Catholic (337); Greek Catholic (94); Agnostic (9); Reformed (558), and Jewish (193 or 16% of the total population). By 1910, the population had grown to 7,811, of which the majority of the inhabitants was made up of Hungarians. Many Jewish refugees arrived from Galicia during WWI, including Hasidim with their leaders. The Jewish population grew significantly after the war, reaching 2,913 in 1921 and 4,262 (of a total 13,331 or 32%) in 1941. A yeshiva with dozens of students was opened in the mid-19th cent and a Great Synagogue (apparently built of stone) was erected in the early 20th cent. The community maintained numerous welfare and charity organizations. It also supported a yeshiva run by Rabbi Yitzhak Isaac WEISS, head of the Hasidic SPINKA dynasty. A Hebrew school with an enrollment of 150 children was also active. Most of the city's trade was in Jewish hands. Jews also owned two banks, three flour mills, two distilleries, a canning factory, a brickyard and a number of farms employing Jews. Jews were also represented in the professional class with four doctors, two veterinarians, six lawyers and three engineers. A few were administrative officials. During the inter-war period of the Czechoslovakian Republic, the Zionists in Sevluš were very active and the Jewish National Party exerted much influence, winning 11 of the 36 seats in the municipal council in 1921 and furnishing a deputy mayor. Agudat Israel was also popular and founded a Beth Jacob school for girls. The Maccabi sports club had a branch in the city. In March of 1939, the Hungarians occupied Sevluš and in 1940, they drafted hundreds of Jews into the Hungarian Labor Battalions for forced labor or service on the eastern front, where some died. In late July or early August, dozens of Jewish families without Hungarian citizenship were expelled to the Ukraine, where some were murdered. A few families were able to return home after being held in a transit camp, only to be later moved into the Nagyszőllős ghetto. In early 1944, a number of Jews were executed for alleged membership in an underground organization. 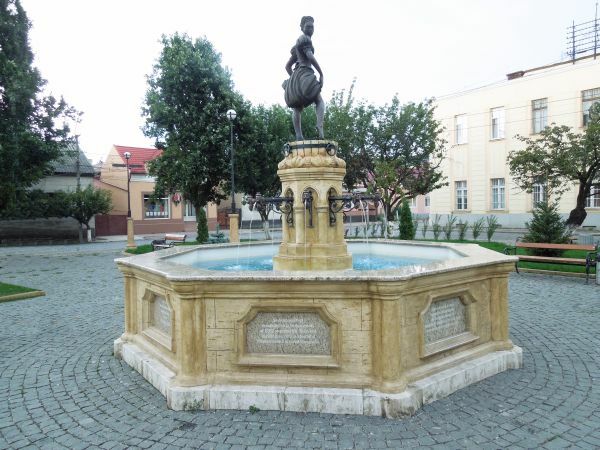 In 1944, after the German occupation of Hungary, a Judenrat (Jewish council) was appointed and thousands of Jews from the area were forceably moved to the Nagyszőllős (Sevluš) Ghetto. Conditions were extremely cramped where many families lived together in the same room, purposely done to cause suffering and disease. Between 20 May and 3 June 1944, the Jews in the Nagyszőllős (Sevluš) Ghetto were deported to Auschwitz in three transports. Today, Vynohradiv, at the foothills of Black Mountain, is the fifth largest city in the Zakarpats'ka oblast with a population of about 24,366 inhabitants (2007). It is an industrial and communications center, home of the Elektron Manufacturing Consortium. There is also a plastic products plant and sewing, footwear, canning and cheese factories. A great number of the Jews of Vynohradiv were murdered in the Holocaust. Most of the surviving Jews who returned to the town after the war, left. Some emigrated to the United States, to different countries in Europe and some even to Australia. About 400 Jews emigrated to Israel, some illegally during the period of the British mandate.